I like being in Quezon City. 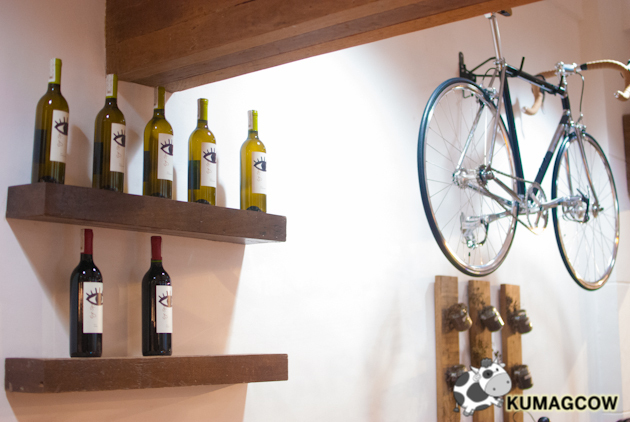 One of the perks of living here is that you never could stop discovering places to have an adventure, to wine or dine. 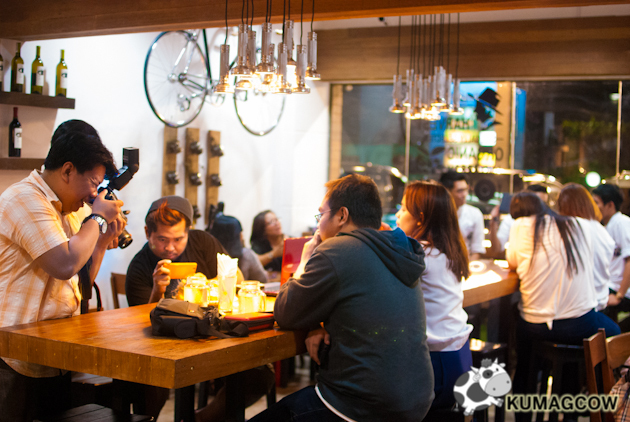 On the day we had an abrupt food crawl in the Quezon City - Tomas Morato area, my Sensei and New York famed Fashion Photographer Xander Angeles saw me posting food shots on Instagram - and invited us over their new restaurant named Runners Kitchen. It's located at the creek side, on a building beside the bridge in Tomas Morato. It's in between Kamuning Road and E. Rodriguez Avenue. This place spurred from the ideas and plans of running enthusiasts (all members of Run365PH) Xander Angeles, Abby Asistio, Glaiza De Castro, Bianca King, and several partners. These guys run together, Originally, the plan was to have a food truck - but they ran into trouble with permit requirements from individual cities where they wanted to have food to be sold. So the next option was settle in one city (which they find more practical too! ), and put up a restaurant here. They are opening this place officially in March. Athletes, runners, bike enthusiasts can enjoy healthy, some gluten free, well balanced meals in this place. The moment I stepped in, I meticulously looked at the restaurant's interiors. I asked who did it and they laughed a bit because I was talking to him already. My Sensei Xander has what you can say... aesthetic, much of an artist. Knowing him for quite a number of years, the design sort of made sense to me. He used raw looking wood for the bar, and continued on to the beams on the ceiling to cut off the bare white wall. He also installed desk lamps on a series and got that over the non seating bar (as they're not serving cocktails) but I could see they're making really good cups of coffee and serve a pretty good selection of wines, a choice of good beers, that fervently follow their restaurants theme. It's like after office hours. When executives sit down and roll up their sleeves, go out and ride their bikes or run on a weekend. Then hang them up so they could recharge, refuel, grab something healthy so they won't be piling up the calories they lost during the sport. They have ample amount of lighting, no place to actually get blinded or be bothered. It's cozy, a place where you could bring your book - to curl up and sit on a table. Order a cup of coffee and travel through thousands of places virtually. 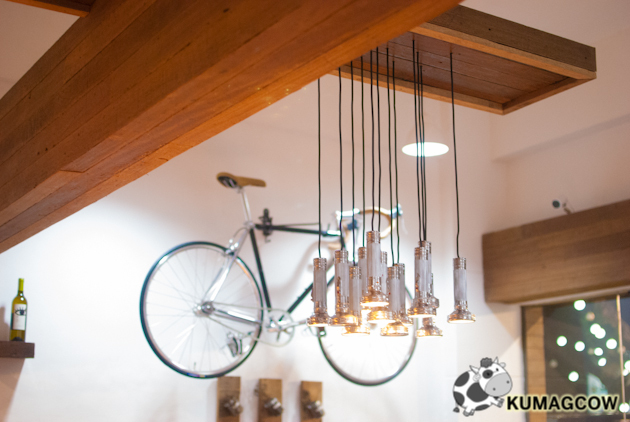 The whimsy, are those light fixtures that mimic flashlights and a real deal working Fixie bike on the wall. Aside from that, the table lamps on the bar, the small wood panels, the writings on the wall, in some way can be a conversation piece. You get assured, reading inspirational treatments like these in one part of the room. I think it's just a start and they might get more in the other blank walls, though less is more. The place could properly seat around 50-70 people, and could probably use the outside areas for that too. They have ample amount of parking, guarded by the building. As for acoustics, that might be a little thing to improve on because you can probably hear everyone else's conversation (but please don't!) since the walls are bare (not padded as with other normal restaurants) with paint. People who usually hang here though are civilized, so if you're a little rowdy, please be nice when you're staying for a while. The place isn't cramped. They did a good job inserting mirrors on these wall treatments so you get the illusion of a more open space rather than "just a wall". The shelves all have the wines they have available in the restaurant but I'm sure they have these chilled somewhere in the kitchen/commissary. 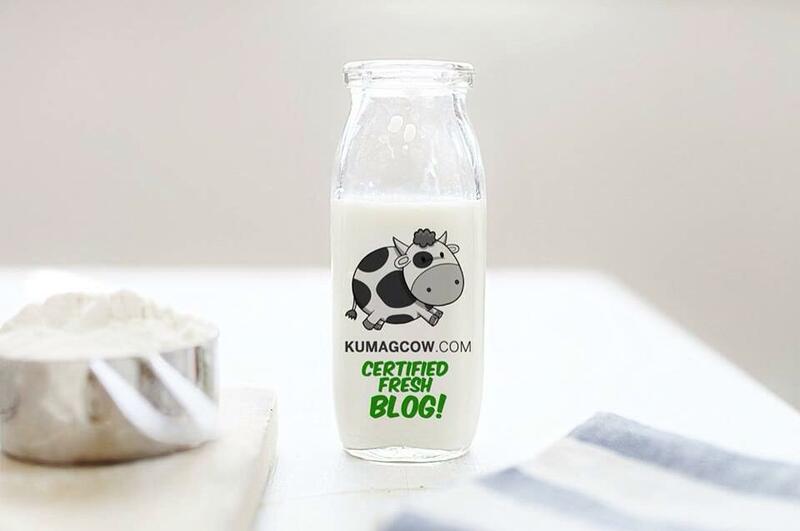 They make everything here including the preparations, so you wouldn't complain a single day about freshness of the produce they use for the food they serve. Our salad was green, no damage, no wilting, no bruises whatsover. I'll tell you about that later. I guess my Sensei Xander Angeles and his partners did a pretty good job with this place. I can only imagine how it might have looked before they moved in. This probably took countless months, no, years of preparation. If all the passionate people in the Philippines made their work like this, it'll be bad a$$. See how they got it done here? 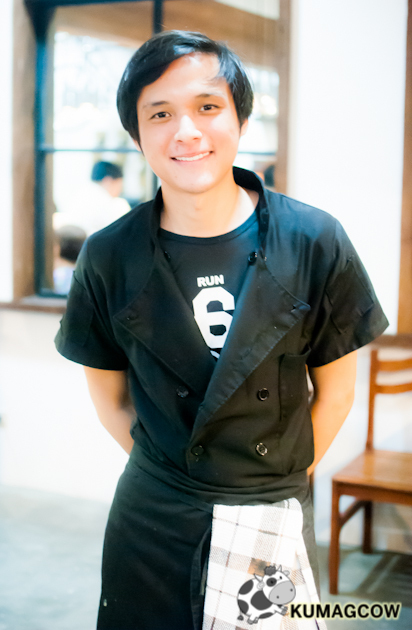 Before we delve into the food, I'd like you to meet Chef Matt Henares (Matthew Ramos Henares). He's the son of famed manager to the stars Ronnie and his wife Ida Henares. 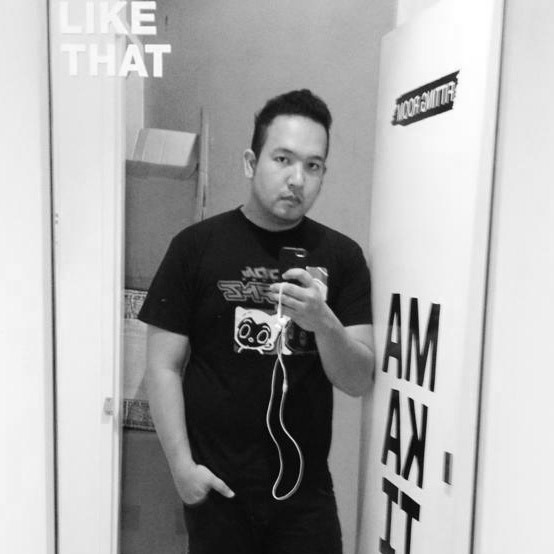 He's a former Benildean, mentored under Philippe Agnese who right now heads City of Dreams Manila. He's also gone through a couple successful restaurants in his belt like PiggyWiggy, Liro's Restaurant (in Paranaque). Oh and did I forget he's a Candy Cutie too? About the menu here, he's wasn't too keen about it in the beginning because he used to always prepare very unhealthy, non-guiltless pleasure level food. He's always in competitions, and he's won most of them using ingredients that are either too fatty, expensive but still real good. Bianca King convinced him to do this menu and they're keeping things at under 300-400 calories, which was a challenge for him really. Some dishes are unique, which you'll see in a bit. They did this to make everything "healthy", making everything from scratch (even the mayo) and replacing some of the ingredients with good ones just for this hashery. 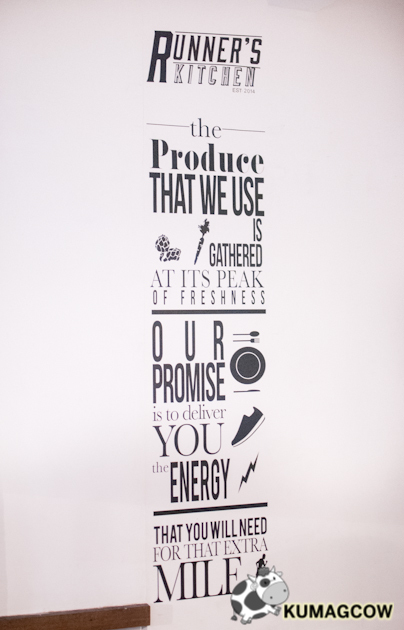 All of their produce is privately harvested for Runner's Kitchen and says everything is organic. They've even got wild boar for bacon, they grow it for them as they're very careful with putting anything on their menu. With this kind of food, he now believes in the movement. He thought it was only going to be a job, but now it turned into something he sternly believes in. He gets to be a good example for his girlfriend and his own family. Even if he's out of the Runner's Kitchen, he makes it a point to cook good food in the same line as this. Initially, they thought it wouldn't work. But now, they're getting the traffic that they want for the restaurant. Their only wish is, to make that good, healthy meal without depriving you with superior and satisfying food on the table. 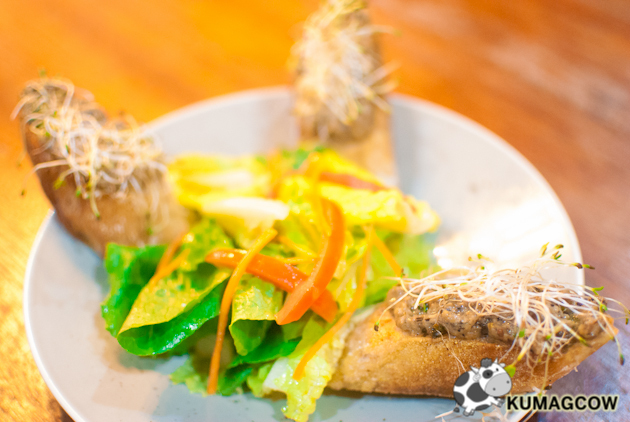 This is their Artichokes and Tea Smoked Quesong Puti on Whole Wheat Crostini Bread. 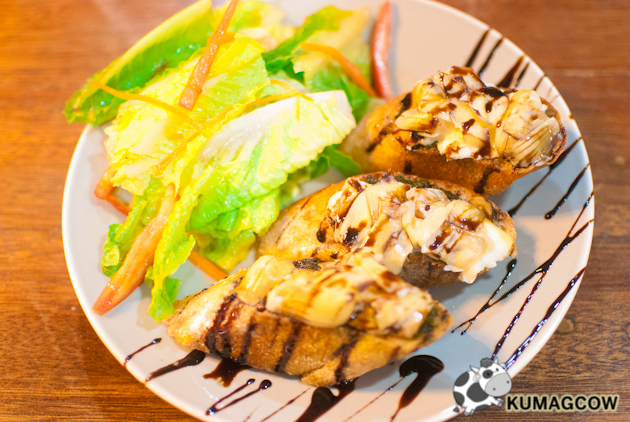 The cheese is smoked in green tea, herbs, and the zest of a variety of citrus fruits. They didn't want to divulge the whole recipe of course but you can really tell the difference when you take a bite off of this cheese. 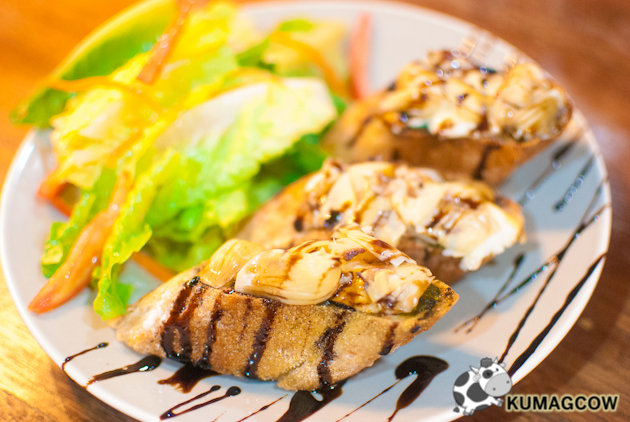 The softness of the toppings, including the sliced artichokes, balsamic vinegar and crusty bread makes this a play on flavor and texture. They also made a pretty decent salad with that, which impressed me because the leaves, all the veggies were flawless! Starting the meal with really good entrees was indeed, just the tip of the iceberg. 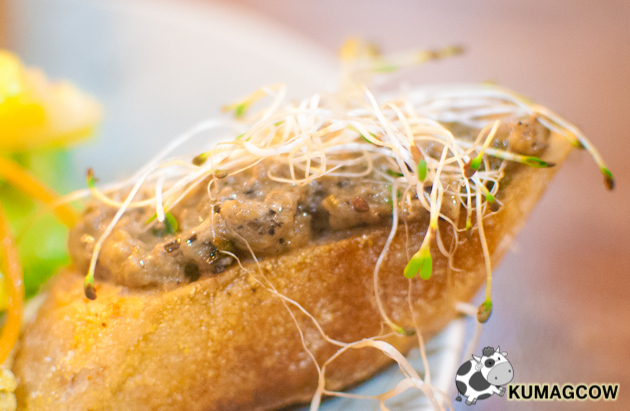 This is their Eggplant Caviar on Whole Wheat Crostini. It's pureed eggplant made to mimic caviar on top of lovely crusty bread. 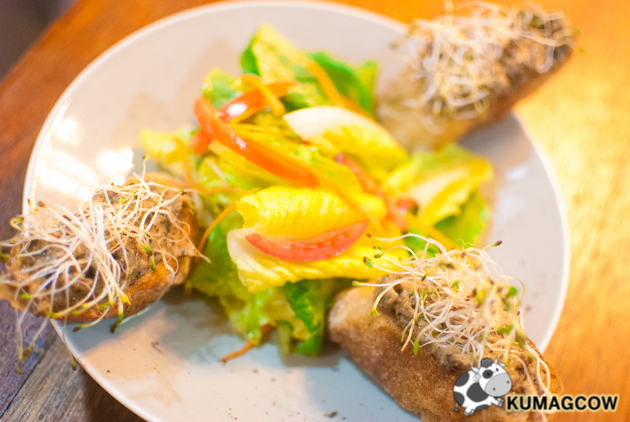 To add a little freshness, they put in alfalfa sprouts. So all in all, you get a creamy texture and some crunchy bits off of those strands. Sick. The salad serving looked the same with the other one, light healthy oil dressing on it too. This one's a show stopper. 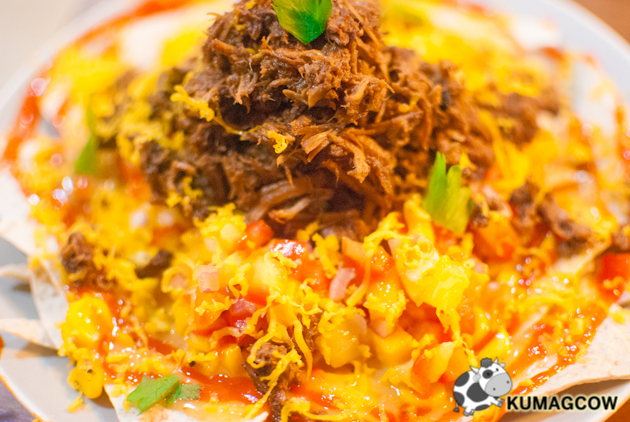 Runner's Kitchen makes their very own Healthy Whole Wheat Nachos. It's my personal favorite on their menu. Never leave this place without ordering it, if you felt that I was ordering you around... I am. You won't regret it. The mango, tomato, pepper and flatleaf parsley, smothered with lovely cheese and a bit of hot sauce for a spicy kick, you can't go wrong with that. The chips? Don't bother those grainy commercial ones fried on unhealthy oil. This ones got baked whole wheat flour tortilla. The meat on top, is freshly cooked, marinated chicken adobo. They cooked this for countless hours, removing each unwanted piece, scooping excess fat along the way. You don't get oily stuff in your body so really, no guilt. Aside from that, the servings in this place looks always good to share. Trust me on the nachos. Japanese? They've got that too! This is their Spicy Tuna Quinoa Roll. Instead of the normal Japanes Rice, they've put in Quinoa which is a seed known to have many nutritional benefits because it's loaded with fiber, protein and minerals. 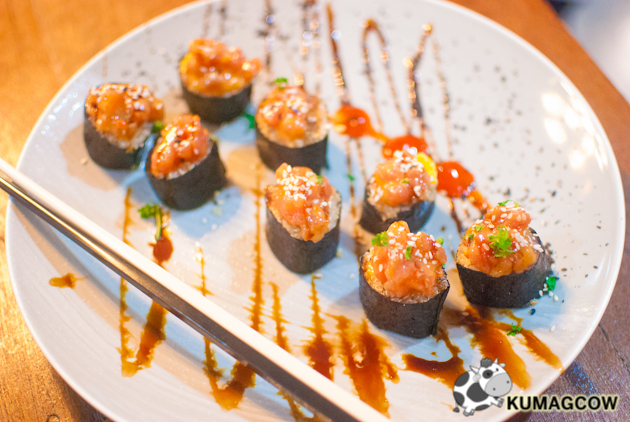 The tuna is fresh, the spice with it makes it even more tasty without you getting that fishy aftertaste. Tuna and the quinoa is much like a canvas so whatever they put in, you'll be getting it back with an appreciated bite. The small amount of sesame seeds would make your Tuna Quinoa Roll a little nutty, so everything actually complements each other. It's got sense, they even use light soy, so there's low salt content. 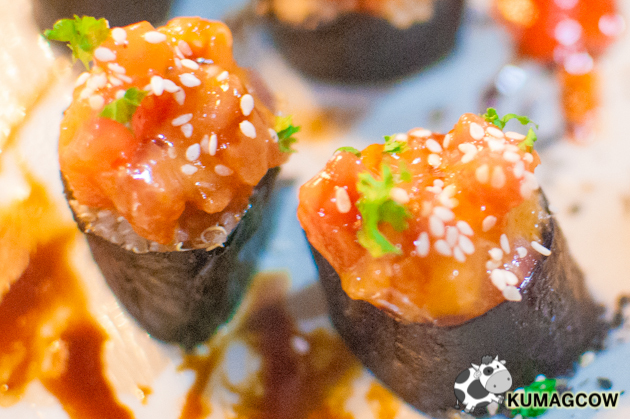 Your usual sushi just became healthy, isn't that neat? Another discovery is this Wild Boar Carbonara. I must say, this is my second loved dish on their menu. Not that it's inferior to the other one, but it's really good. 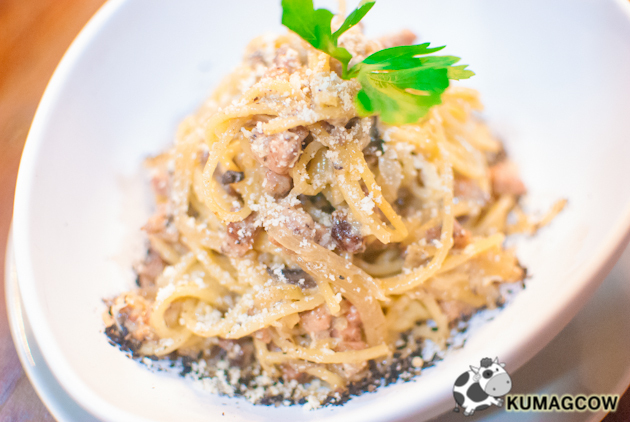 Chef Matt knows how to make classic carbonara, but the difference is the wild boar bits that come with it. It's different from the usual bacon because this one's a bit chewy. The difference in texture and how it all comes together with the pasta isn't conventional, but it's so good. 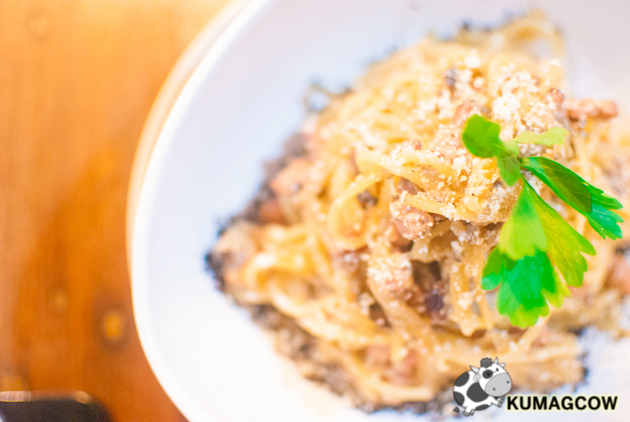 It's comfort food, with the right amount of wild boar goodness in it. I'd like to have it again when I got back to Runner's Kitchen... which will happen very soon. 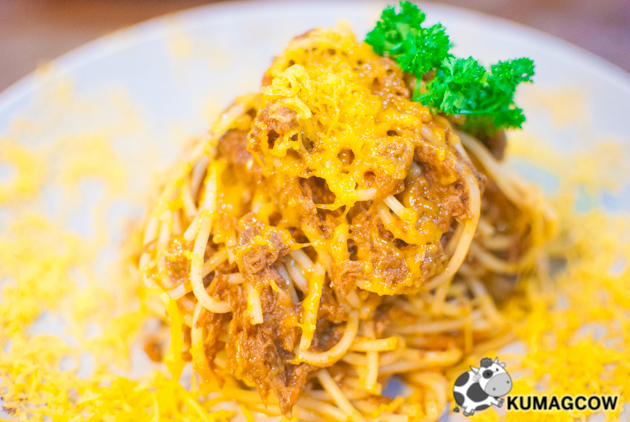 For a more manly meal, take this Beef Brisket Pasta. It's very pungent smell and flavor might be a wee bit strong, but I guess its charm comes from that too. 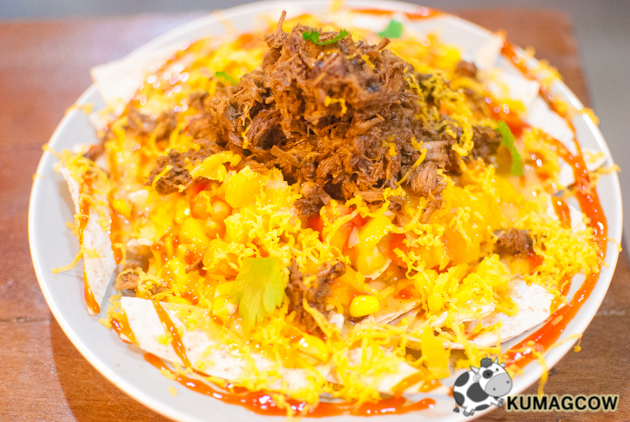 It's meaty, it's filling and you'll love the amount of cheese together with it. It's a bit overwhelming and we could only taste the meat on the plate, but the Chef was glad to hear feedback from us and takes that into account. That's a mark of a great Chef right there. He didn't want to hear sugar coated comments and gladly takes note of it, even goes and taste his dishes to verify what we have observed and says thanks, would you believe that? 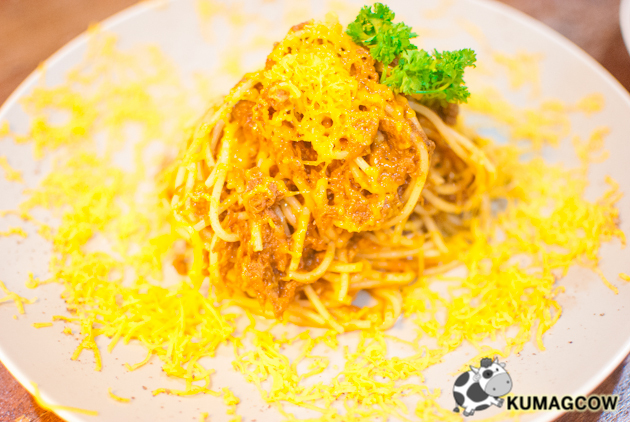 Still, I'll take my friends and family here because I've got one thing on my mind how I'll get healthy food without depriving myself of flavor and goodness, that's Runner's Kitchen. I only would ask for drinks on normal days but I didn't have to because they served water in huge mason jars right off the bat. Utensils, table napkins, were of arms reach in wooden boxes placed on the table's center. I had the notion of having food sent to our table for a longer time, but they were pretty fast, snappy. Service is impeccable, they're dressed quite nice and just bother you on the table when needed, that's a plus. 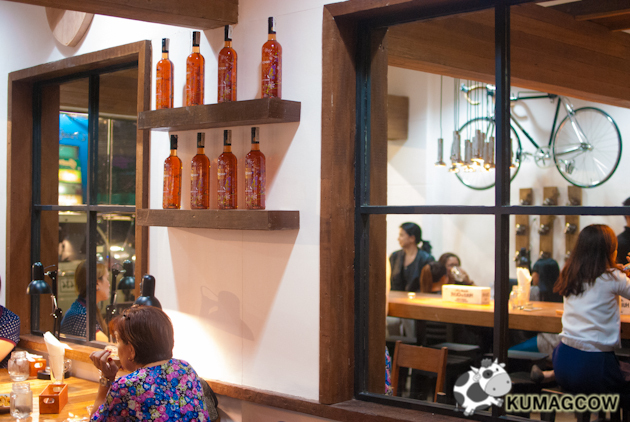 Aside from that, the owners and the Chef would often be there to make sure you're getting everything you ordered. 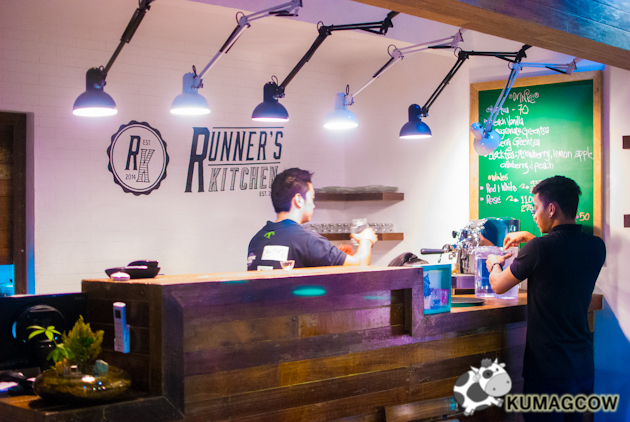 Runner's Kitchen is located at the creek side in Tomas Morato. 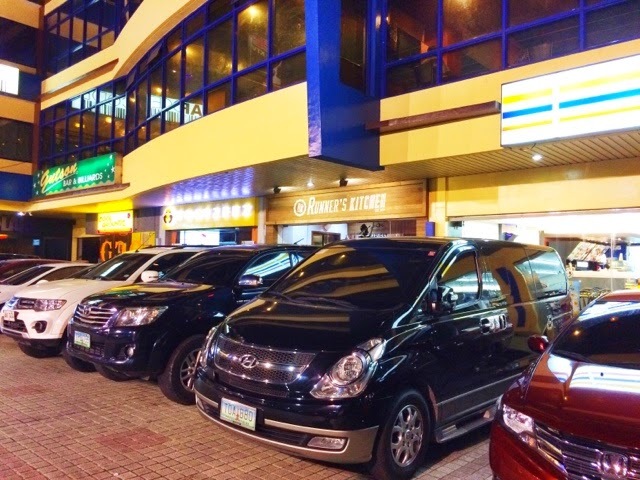 It's a commercial space right beside the bridge in between Kamuning Road and E. Rodriguez Avenue. Again, trust me on the nachos.